Legitimate and authenticated trackbacks, posted by active bloggers are rapidly becoming the currency of blogging. When someone takes an interest in what you have to say, on your blog, they have two options available to them if they want to let you know: comments and trackbacks. Both are great ways to interact with others in the blogosphere. Trackbacking is preferred by most bloggers. In order to begin using trackbacks effectively, you must understand PERMALINKSand permalinking. When you view a blog, via the main page, you are looking at a collection of posts, pages and quite often, a plethora of side-bar add-ons. A PERMALINK can be thought of as the PERMANENT LINK to a post or article. That is, the URL listed within the address bar after you’ve clicked on an article or page header within a blog. The default permalink, or “ugly” option, AND the most cross-platform, server and browser-friendly types of permalinks are the DEFAULT or “?p= ” variety. Another type of permalink option is the the “Date and Name” variety and there are others. For example, WordPress gives you four Permalink options (found under the options, permalink choice in the wp-admin.php interface). 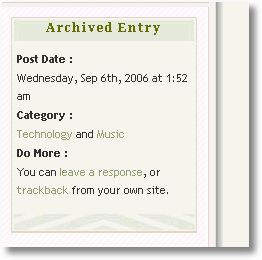 The PERMALINK for this article is: http://www.mustech.net/2006/09/support-music-you-like-music-dont-you/. No matter what changes on my site, as far as new articles and post being added, you can always find this article here: http://www.mustech.net/2006/09/support-music-you-like-music-dont-you/. In order for trackbacking to work properly, you must have the correct PERMALINK to reference in your POST or COMMENT. Without it, the trackback will not work properly or like you want. When you click on the response link, typically, you will be sent to a URL that looks somewhat like this: http://mustech.net/#respond . From here you may enter your response, etc. Although, visually they look the same (on the web page, not in text here) the second is actually pointing you to the correct PERMALINK. You may copy & pastethis URL for use in your POST; it is the correct PERMALINK to the article you are looking at. This is the PERMALINK you would use to make a proper trackback. NOTE: ALL TRACKBACKS ARE NOT TREATED THE SAME BY BLOG INDEXES LIKE TECHNORATI AND OTHERS! If you want to get credited or give credit with a “blog links here add” then a trackback will have to be sent via a POST or PAGE from your site or from theirs (and not the COMMENT line). I am fairly certain that Technorati does not give “blog credit” for sites listed on BLOGROLLS since they are not posting to a PERMALINK but rather the blog itself. To make a trackback, all you have to do is reference the PERMALINK in the COMMENT, POST or PAGE section (actually, they would have to post in the POST or Page section, unless you were an authorized contributor) of another blog. Some blogging softwares do not automatically send trackbacks, even if you follow what I just stated, adding some confusion. If you are posting a new article from your site referencing a PERMALINK on another site, you may have to add it to a special section of your posting panel called TRACKBACKS or PINGBACKS. With software such as WordPress (if you have a current version) the trackbacking part is handled automatically. If your software does not allow trackbacks, at all, there is still a way to accomplish this. Liz Strauss has written a great article about online trackback tools and troubleshooting. And as an added bonus to your understanding of trackbacks, I am going to send her one, from here, that points to her PERMALINK about that VERY article (amazing, no? ): http://www.successful-blog.com/1/great-find-2-standalone-trackback-tools/ Note that Liz is using a “pretty” version of a the PERMALINK structure. Maybe I will get lucky and she will send me a PERMALINK from a POST thus solidifying this tutorial. In addition, cool software like blogdesk and Live Writerallow you to send trackbacks from within them. Here is what happens “behind the scenes” with a trackback: First, a ping or trackback is sent from your site to the site where the article, of the PERMALINK you are sending to, resides. Depending on the setup of the site being pinged, they may receive the ping or not (they may have chosen to have pingback/trackback disabled). If they DO receive the ping, usually the trackback will be listed within their comment section with a “blurb” of something you stated, in your article, about their article. They may have their blog set to moderateall incoming trackbacks, if so, they will have to approve your trackback before it gets listed. If they really liked your article, they may write a brief post about your article and then you would receive a ping or trackback from them. The technical aspects of how this works falls under the auspicious of “auto-magic”. It’s automatic and it works like magic… No further knowledge required. If a trackback is posted in a COMMENT and not a POST, Technorati and others will not give you a “blog link”. Unfortunately, it doesn’t work like that. 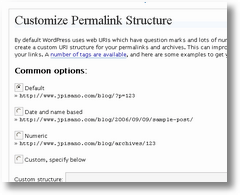 Stupis WordPress Tricks: Quick article about linking and links to more! Freshblog:Article about using trackbacks, especially with Blogger. echoes of the ego: Good article by Jane Foster about setting up your blog and terms like ping, etc. Does this help? I welcome comments and or other links for clarification! If you read this send me a TRACKBACK, I’ll let you know if it worked!